Mix package contents with chick peas, parsley, onion, and olive oil. Rinse leaves. Drain excess moisture. To roll leaves, lay leaf flat, stem side up and closest to you. Place 1 Tbs mixture on leaf. Form long and narrow like a finger from right to left and about an inch from the bottom of the leaf. Fold the bottom of the leaf over the formed meat fold in the sides, and then roll the formed meat away wrapping it entirely with the leaf. Put to the side while you roll the rest. To prepare the pot, place a layer of unused flat leaves in bottom of pot. Layer stuffed leaves in pot. Alternate direction of leaves in layer. Layers should be firm but not squeezed together. Add garlic and lemon. 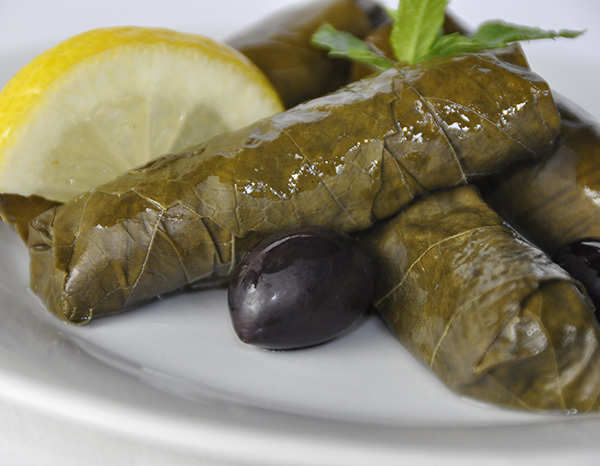 Turn dish upside down and place on top of stuffed leaves inside pot. Add water to cover dish. Cook on high heat until pot comes to a boil. Lower heat to maintain a medium boil. Let cook for a total of 2 hours. Add water if it gets below level of top row of grape leaves.